Please read these product terms and conditions carefully as they set out the terms under which Easy Curtain Services makes all its products available to you ("Product Terms"). You must read and agree with our terms and conditions before buying online. When buying goods from our website or via an email invoice you enter an agreement with Easy Curtain Services, 7 School Road, Eccles, Manchester, M30 7HN trading as www.ezecurtains.co.uk. The agreement will be concluded when you place the order. The products we sell are either photographed or digitally produced and are accurately displayed on the website, however, due to different types, styles and settings of computer monitors shading and colour may appear differently to the exact colour. Due to this we will only allow orders for fabric goods to be placed. Once you have request and received a free sample to ensure that you are happy with the colour and also quality before ordering (please be aware that multi patterned samples may not show all colours). Whilst every attempt will be made by Easy Curtain Services to ensure that the goods sold and delivered match in every respect any sample or description shown or sent to you, any minor or immaterial variation, change in colour or pattern between the sample or description and the goods delivered shall not entitle you to reject the goods nor to claim any compensation for such variation or change. Many of the goods we sell are made according to your sizes. It is your responsibility to take the correct measurements of your window, curtain pole or track. If you are unsure about any products or how to measure please use the many measuring guides on the website or use the contact form on the website for help before ordering. You must check the product details and measurements of the goods before placing your order. You are responsible for checking all the order details contained within the email confirmation. We cannot accept returns or refund the money if you have given us incorrect measurements as we will not be able to resell the goods as they are made to measure. Made to measure products are custom made to your precise requirements, including curtains, Roman blinds, cushions and tiebacks. Once made our products are suitable only to you and therefore cannot be cancelled or returned. Because of this it is extremely important that you are sure about the product that you want and also the size you require. We insist that you take advantage of our free sample service before placing an order, Easy Curtain Services cannot be held responsible if you dislike the colour or the general quality of the product. We strongly recommend that you double check your order to ensure that the products ordered and measurements taken are correct. This does not affect your statutory rights. Please note that fabric is cut by highly skilled professionals who will be as accurate as possible within a variance of +/- 1cm. We will not replace the order if the sizes are within this tolerance limit and you will not be entitled to reject the goods. Most fabrics are dyed and therefore each batch can vary slightly in shade. Due to colour variations between product batches we cannot guarantee shade matching for previous orders, in addition the sample despatched to you may also be slightly different in shade to the eventual order received. Due to the print design of some pattern fabrics it may be that the sample despatched does not show the full range of colours or pattern design, if you are in any doubt as to the precise nature of the fabric you are advised to contact us using the contact form on the website for further advice. When ordering your goods you are agreeing to a legal binding contract. According to The Consumer Protection (Distance Selling) Regulations 2000, made to measure goods, e.g. curtains, roman blinds & cushions are excluded from this legislation and the 7 day cancellation rights do not apply. Cancellations are however still possible and a full refund will be issued as long as products or parts of them have not been made. In the event that your goods have already been made we are unable to refund your money. Contact us using the contact form on the website as soon as possible if you wish to cancel or change an order and we can check if the order has gone into production. We strongly advise that you check the email confirmation of your order to ensure that you have placed the order correctly. Please check the order details on the email confirmation. The price you will pay is the price shown on the email invoice we send you and on your confirmation email, the total price shown is the price you will pay. On receipt of your confirmation email check to ensure you are completely happy with the price of the goods ordered. When ordering products from the ezecurtains.co.uk website we can only process your order when the goods ordered have been paid for in full by credit or debit card, paypal or bank transfer. You can pay on-line with all major credit cards, debit cards and PayPal. Your payment card details will be encrypted to minimise the possibility of unauthorised access or disclosure. Authority for payment must be given at the time of order. You will be charged for items at the point of order. Our liability to you in connection with any order will not exceed the total price charged for the relevant items. We accept internet orders only from Web browsers that permit communication through Secure Socket Layer (SSL) technology, for example, 3.0 version or higher of Explorer and versions 3.02 or higher of Netscape. We specify an estimated delivery time in the email quote we send you prior to placing your order. Delivery will be made to the address specified by you. Please note that we can only deliver products within mainland UK. All deliveries will be made to you by our courier. Please check your delivery for obvious damage before signing for delivery. If you think your goods may have been damaged. Then please don't accept the delivery and don't sign. The courier will return the goods to us. Also if possible please take a photo of the damage and forward it to us by email or our contact form. We do our best to secure delivery within the period quoted but shall not be liable for loss occasioned by delay in delivery or arising out of any cause beyond our control. We advise you not to book a fitter to install a product until the order has been delivered and that you have checked that there are no defects and that all parts are complete. 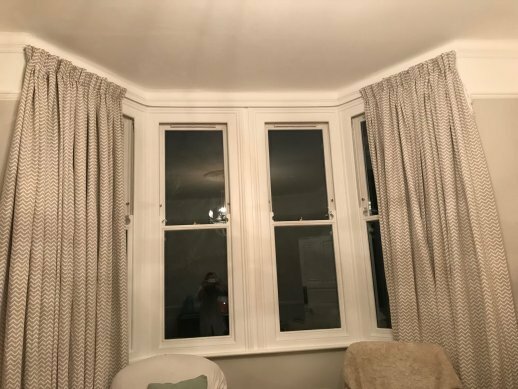 All Easy Curtain Services products are rigorously quality checked before dispatch but in the unlikely event that you experience any problems please use the contact form on the website to let us know as soon as possible. You have 7 days following receipt of your goods to report any damaged or defective goods due to manufacturing, or damage caused while being in the delivery process. We will deal with your queries promptly and if necessary arrange for a replacement to be sent. We reserve the right to ask for digital pictures with regards to the issues reported or to ask for the product to be returned to us for inspection. This does not affect your statutory rights. Easy Curtain Services offer a 12 month manufacturers guarantee on manufacturing faults. We reserve the right to either replace or repair the product and it may be necessary to return the goods to us for inspection prior to a replacement product being despatched.This does not affect your statutory rights. We may use technology to track the patterns of behaviour of visitors to our site. This can include using a "cookie" which would be stored on your browser. You can usually modify your browser to prevent this happening. This may disable some functions on the website. Such as the shopping trolley. The information collected in this way can be used to identify you unless you modify your browser settings. If you have any questions/comments about privacy, you should contact us using the contact form on the website.